The theme of the Forum is highly relevant to our RC, focusing on the topic of the ‘Challenges of the 21st Century: Democracy, Environment, Inequalities, Intersectionality’. Twenty years after the start of our century, the optimism of the Millennium has faded and the challenges we face for living together on a limited planet are even more urgent. While the expansion and the deepening of democratization was taken for granted at the turn of the Millennium, democracy has been at stake in an increasing number of countries, while its key component such as diversity and equal respect for all citizens are threatened. The hope for a global democracy able to tackle global issues such as climate change, migrations and rising inequalities have faded. It has now become clear that to face global challenges, democracy needs to be re-invented within and beyond the representative system. The environmental crisis and climate change are now a worrying reality. How can we live together on a limited planet? Land and food have become again major objects of struggles. Environmental and socio-territorial conflicts have multiplied against extractives industries. Who are the actors who bring innovative solutions to keep our societies thriving within the planetary boundaries? How does the global environmental crisis lead us to re-think our world and our discipline? 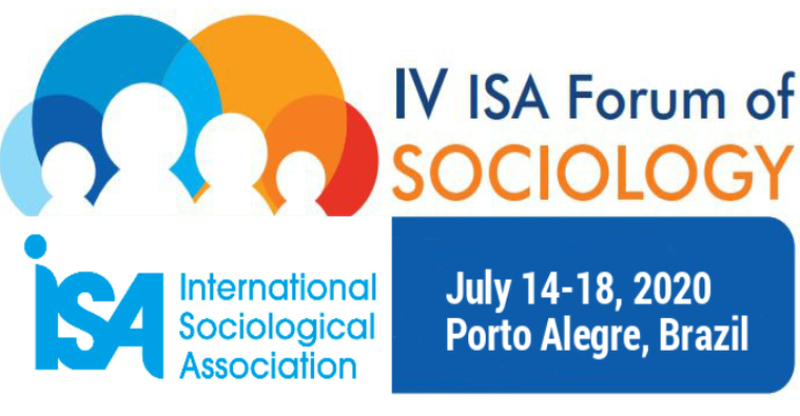 The 2020 ISA Forum will provide sociological analyses of these four global challenges paying particular attention to their interconnections and to possible solutions. We will discuss how both progressive and conservative actors and movements tackle these challenges and their conflictive perspectives. We will use this Forum to ask how our discipline has been meeting these four global challenges and it has been transformed by them. What are the contributions of the actors and epistemologies of the South? What are the new trends in global sociology that allow innovative analyses of these challenges? What are the main obstacles we face to tackle these problems? How can innovative sociological analyses contribute to grasp and to face our common problems in the Global Age? All members of RC48 are invited to enter to the Forum website https://isaconf.confex.com/isaconf/forum2020/cfs.cgi and suggest sessions following the guidelines of the ISA. As you can see the above keywords are particularly relevant for our subject. Conflict, democracy, and social change are recurring issues in our RC, speaking about social movements as well as collective action. Besides, the conference will be held in Porto Alegre, a very meaningful place for the global movements history, this could be important source of inspiration for our session proposals. In order to enrich our scholarship we encourage submissions for sessions on all aspects of Social Movements theory and research with a particular emphasis on the recent mobilizations around the world. Each proposed session should include title, description, rationale and suggested form of the session as well as contact details. For further information about the possible form of sessions, please visit the Forum website. Deadline for submission is March 15th 2019. After this date, the submissions platform will close and it will not be possible to suggest additional sessions. The session coordinator in consultation with board members will decide on the session list by April 8th 2019. Additional information will be distributed as it becomes available.